For more information, contact Mary Bones at 432.837.8734 or ude.s1555771258sorlu1555771258s@byr1555771258am1555771258. 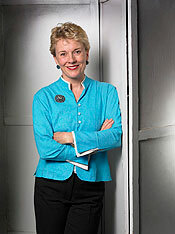 Adair Margo was the Chairman of the President’s Committee on the Arts and the Humanities during the two-term Presidency of George W. Bush. During her tenure, Margo focused on international cultural diplomacy beginning with Mexico. She traveled with First Lady Laura Bush to Paris, France for the United States reentry into UNESCO in 2003 and was appointed by Secretary of State Colin Powell to the US National Commission for UNESCO. Serving as a cultural ambassador, Margo traveled to Uruguay in 2004 at the invitation of U.S. Ambassador Martin Silverstein and she led the highest level cultural delegation to visit the People’s Republic of China at the invitation of Minister of Culture Sun Jiazheng in 2006. Adair Margo received the Aguila Azteca, the highest recognition given by the Mexican Government to a non-Mexican citizen, from Ambassador Arturo Sarukhan at the Mexican Cultural Institute in Washington, DC in 2007. In 2008, she received the Presidential Citizens Medal from President George W. Bush who cited her “rallying of support for the cultural agencies and strengthening of international relationships from Mexico to China”. From 1985-2010 Adair Margo owned the Adair Margo Gallery in El Paso. She became especially devoted to the legacy of Tom Lea, founding The Tom Lea Institute in 2009. She recorded his oral history, co-editing Tom Lea, An Oral History (1995, Texas Western Press) that won the Border Regional Library Association Award, and wrote the forward to The Two Thousand Yard Stare, Tom Lea’s World War II (2008, Texas A&M Press), winner of the Texas Institute of Letters Award. Margo also recorded the oral history of National Humanities Medalist Jose Cisneros, co-editing José Cisneros, Immigrant Artist (2006, Texas Western Press) and she contributed the opening chapter to Grace and Gumption, The Women of El Paso (2011, Texas Western Press). She holds a B.A. in Art History from Vanderbilt University; studied Renaissance Art History and Italian Studies in Florence, Italy with Syracuse University; and, earned her M.A. in Art History from New Mexico State University. She has taught art history at the University of Texas at El Paso and New Mexico State University. In Texas, Adair Margo served as Chairman of the Texas Commission on the Arts and on the Texas Higher Education Coordinating Board. Other state boards included the Texas Book Festival, Humanities Texas, and Texas A&M University Press. Margo also served on the Southern Association of Colleges and Schools/Commission on Colleges Executive Committee, and participated on the board of Mid-America Arts Alliance (ExhibitsUSA). She currently serves on the Smithsonian American Art Museum Advisory Council, the National Advisory Board for the Laura Welch Bush Institute for Women’s Health, and as the President of the Mexican Federation of Private Associations for Health and Economic Development (FEMAP) Foundation. Courtesy of Adair Margo Fine Art.